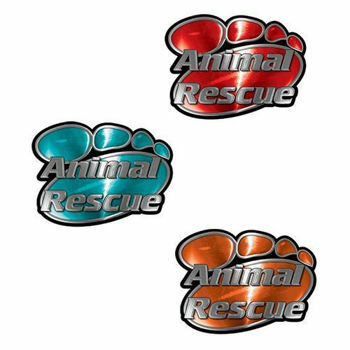 Animal Pet Rescue Paw Decal from Weston Ink. Place on your car, house windows or even get one for the walls for inside your house and show everyone your love for saving animals and giving them a new chance for a good life. Our new 7 Color translucent ink process makes all of the color of this graphic reflect with the reflective option and we now offer this graphic in a special canvas like interior wall decal. Our reflective graphics are made using a special process where all the colors of the graphic reflects and looks really cool at night.